Someone laughed. It might have been my sister, dad, grandmother, or one of the dozen friends and family members arrayed around that bed in my parents' room. Before we cried, said goodbye, and fanned out in separate cars to begin our private journeys of grief, something was said, at the moment she died, in a summer evening's half-light. And somebody laughed. Maybe it seems strange, but I like to remember it. I come from a long line of mama's boys. My dad is a mama's boy, my uncle is a mama's boy, and my grandfather's mama's-boy-ness was practically clinical, according to family tradition. So, really, what choice did I have in the matter, born at the confluence of all this maternal devotion, except to be helplessly devoted to my mom? When I was a kid, I adored her in a way that made people with perfectly adequate mother-son bonds think, there is a boy who needs more friends in life. Jewish mothers, however, will sooner cut off a pinky than apologize for cultivating religious devotion in their children. Realizing that she had invented a human who would believe everything she said, my mom lied to me constantly about her most mortal enemy: her age. Through her late 30s and into her early-40s, she told me she was 27. The years would climb; her age would not. I believed her, not only because I was a supremely gullible kid, but also because I preferred to think that she, too, was a kid, passing undetected through the land of adults. Even before I knew too much about death, I wanted her closer to me on this side of life. One day, when I was 8, my younger sister Kira got the hunch that mom was making stuff up. Secretly digging through our mother's wallet, Kira found the incriminating ID and brought it to me. "Mom is not 27," she said, displaying the evidence, radiating with a cruel glee. "She's 43!" The words shattered my dumb little ears. I promptly burst into tears. The rest of the story is a memory of other people's memories, but according to the folklore, I ran downstairs and hid in the basement. My mom looked around the house until she discovered her distraught son, curled up in a ball, weeping. "I am so sorry I lied to you all this time,” she said, still lying, probably. Through a staccato of tears, mucus, and traumatic convulsions, I mustered an explanation. "I'm not mad because you lied to me,” I said. “I'm mad because you're old." Eulogies ought to begin with a laugh, I decided, so this is how my eulogy began: with the story of how I learned that parents grow up, too. My mom died on July 18, 2013, of pancreatic cancer, a subtle blade that slips into the host so imperceptibly that by the time a presence is felt, it is almost always too late. Living about 16 months after her diagnosis, she was "lucky," at least by the new standards of the parallel universe of cancer world. We were all lucky and unlucky in this way. Having time to watch a loved one die is a gift that takes more than it gives. Psychologists call this drawn out period "anticipatory grief." Anticipating a loved one's death is considered normal and healthy, but realistically, the only way to prepare for a death is to imagine it. I could not stop imagining it. I spent a year and a half writing my mother a goodbye letter in my head, where, in the private theater of my thoughts, she died a hundred times. In buses and movie theaters, on Connecticut Avenue and 5th Avenue, on crosswalks and sidewalks, on the DC metro and New York subway, I lost her, again and again. To suffer a loved one's long death is not to experience a single traumatic blow, but to suffer a thousand little deaths, tiny pinpricks, each a shot of grief you hope will inoculate against the real thing. A boundless black terror is how I imagined life without my mom. The history of grief, or what we know of it, is written by its greatest sufferers and ransacked with horror stories, lugubrious poetry, and downward-spiraling memoirs plunged in sadness. For some people, the death of a loved one is truly life-stopping, and I worried it would stop mine. Then, in the weeks after she died, something strange happened. I did not plunge. Life did not stop. Instead, I felt something so unspeakably strange, so blasphemous, that I wondered if I could talk or write about it, at all. I felt okay. Even stranger, I discovered, is that I wasn't strange, at all. Despite the warnings that grief would drag me through the prescribed five stages and discard me in a darker place, bereavement researchers have recently learned that we've been wrong about loss for centuries. For some, grief is a dull and unrelenting ache that fades—or doesn't. But for many of us, grief is something else. Grief is resilience. If George Bonanno's office were discovered underground by a group of archaeologists, they would think they'd found a tomb. Volumes about death and mourning fill the wall-sized bookcase. Terra cotta figurines, excavated from Chinese burial sites, line the shelves, facing inward. At the center of the room, there is a full-size standing skeleton. One afternoon in October, I visited Bonanno, perhaps the most renowned grief researcher in the United States, at Teachers College, Columbia University, to talk about his research. His lab might be trailblazing, but the mission is classically conservative. By studying grief like any other psychological condition, he has exposed the history of bereavement research to be a thread of fables. For centuries, grief has lived a secret life, hiding in plain view, even from our experts. Sigmund Freud coined the phrase "the work of grief," and ever since, there has lingered an idea that mourning is homework to do before we move on. The first systemic study of grief in the United States, by the Harvard psychiatrist Erich Lindemann, in 1942, described a horror show, marked by restlessness, hostility, hallucinations, and an overwhelming preoccupation with the dead. Lindemann had gathered a group of bereaved people—many of whom had lost friends in a recent night-club fire—and recorded his observations, motivated by the conviction that traumatic loss was a medical problem. Grievers who seemed normal in the weeks after, he claimed, were victims of dangerous repression. Twenty years later, in the 1960s, Elisabeth Kubler-Ross' five stages of loss would tattoo themselves onto the collective conscious of Americans. Kubler-Ross, a Swiss-born psychiatrist, interviewed patients at a Chicago hospital about the experience of dying. She devised a theory of five periods, from anger to acceptance, with each stage serving an essential part in the mourning process. Her book, On Death and Dying, became a national bestseller, but it wasn't just a mess of shoddy science. It was shoddy science based on people who were dying, not people who were grieving. Bonanno's work, which has redefined the science of grief research, revealed that Freud was wrong about work, Lindemann was wrong about repression, and Kubler-Ross was wrong about everything. The deepest grief is powerful, but sometimes short-lived, and most of us are wired to compartmentalize our most heart-breaking tragedies, even if it makes us feel ashamed to feel all right in the face of expectations that we feel terrible. "The good news is that for most of us, grief is not overwhelming or unending. As frightening as the pain of loss can be, most of us are resilient. Some of us cope so effectively, in fact, we hardly seem to miss a beat in our day-to-day lives. We may be shocked, even wounded by a loss, but we still manage to regain our equilibrium and move on. That there is anguish and sadness during bereavement cannot be denied. But there is much more. Above all, it is a human experience. It is something we are wired for, and it is certainly not meant to overwhelm us. Rather, our reactions to grief seem designed to help us accept and accommodate losses relatively quickly so that we can continue to live productive lives." One of the stickiest myths about loss is that it requires extensive processing– that, in a Puritan sense, short-term pain is long-term gain. To the contrary, Bonanno has found that those who seem to be "working" hardest with their grief often report the hardest coping—not only in the first weeks, but also in the first years. "The more people engaged in their most intense emotions, the longer they would be grieving," he said. In a revelation that surprised even him, “it was laughter and smiling that led to quicker recovering." Bonanno doesn't pretend that smiling is a magical elixir or that laughing will cure the hardest-suffering patients. Grief isn't a single track, he’s found, but a long private journey that splits along three rough paths. 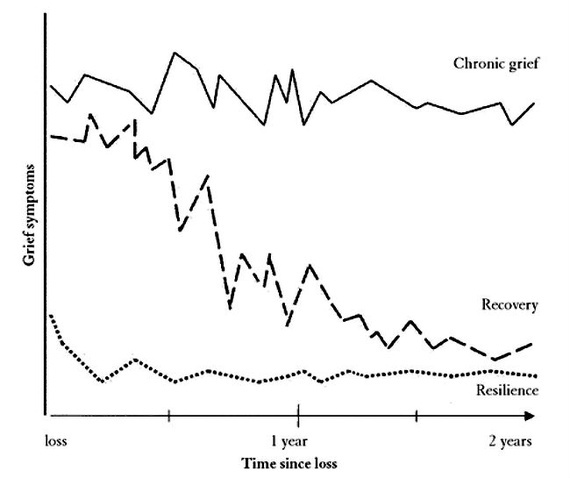 Ten percent of us experience "chronic" and relentless grief that demands counseling. Another third or so plunges into deep sadness and gradually begins recovery. But most of us—"between 50 and 60 percent," Bonanno said—quickly appear to be fine, despite day-to-day fluctuations. Scientists used to consider these patients tragic actors, shoving their feelings into the core of their bodies, where they would only explode with volcanic violence in dreadful ways later in life. But this, Bonanno says, might be the biggest myth of all. "If you think you're doing okay," he said, "then you're doing okay." "I'd look to the ancient Asian cultures," he said, pouring me a tiny glass of green tea from a copper pot in his office. "They have the idea that the person isn't really gone, that the afterlife is porous, and that you can still have a relationship with that person." Years after Bonanno’s father died, he was in China with his family, studying rituals of grief, where he took part in an ancient custom of burning paper offerings in a temple for an ancestor. Bonanno visited a store that sold paper shoes, paper houses, and even life-sized paper people. "It was incredibly cathartic," he said. "You spend a lot of time thinking about their life, what they were really like." "What did you burn for your father?" I asked. "Gold bullion," he said. "He was a working-class guy, didn't get much of an education, didn't like anything rococo. He was down to earth. I thought, with gold bullion, he could finally relax. 'Here's gold, Dad, do whatever you want with it!' It struck me as the right thing to do." "Derek," my dad said toward the end of dinner, "tell them about China!" Food is my family's religion, and restaurants our sacred temples, so to celebrate what would have been my mom’s 64th birthday, our closest friends filled out the back room of a Spanish taperia in D.C. to toast her. This suggested story, however, was not an obvious way to celebrate her motherly qualities. When I was 19, my mom, dad, and I went to China. Over the course of a few days in Beijing, the left side of my face stopped moving. I had contracted Bells Palsy, a temporary paralysis of the facial nerve. A hypochondriac, I was certain that I was dying. My mom, however, seemed to consider my broken face hysterical, lightly mocking my crooked smile in photographs in Shanghai, and laughing uproariously when wine dribbled from my slack mouth onto my pants in a five-star restaurant. Weeks later, my face and dignity healed, I confronted her: Why had she taken such a cavalier approach to the sudden paralysis of her son’s face? "I was worried," she replied, not sounding worried. "Why didn't you tell me?" I asked. She answered with a look—defensive, bemused, adoring. "I couldn't fix your face," she said with a laugh. "Why would I tell you how worried I really was, when all that would do is make you more worried?" For the 16 months after her diagnosis, I returned the favor. We never spoke of the food she couldn't eat, the thick hair she couldn't grow back, or the weight she couldn't keep. Instead, riding home from New York once a month and bounding onto her bed, I'd serve a feast of happy stories harvested from a life spent trying not to worry. I cried often, but privately, in the stairway at work, on the train behind a pair of sunglasses, and in my apartment, indulging a memory behind a locked door. But I only lost it twice in front of her, both times trying to say the same thing: What makes me saddest isn't imagining all the things I’ll miss, but imagining all the things you’ll miss. The wedding dances, the wine-fueled parties, her birthday cards, each emblazoned with ludicrously incorrect ages. For Mom, who drew kinetic energy from every drip of living, as if by photosynthesis, and braved the winter of life with spring in her heart, smiling like a sweet little maniac all the way to the end, cancer was such cosmic robbery. "In the Asian cultures, the idea is that the person isn't really gone. You honor them. You appease them. You can still make them happy, elsewhere." Tears burned in the gutters as I reread those words. "You can still make them happy." It would be so nice to think so. But for those of us who cannot believe in God and afterlives, this is just one of the things you lose forever when you lose a person: the ability to make them happy. My mom and I would play rallying partners in a long game of optimism. Don't worry about me, I said to her, month after month, curled on the bed as her weight dropped, below 100 pounds, below 90, below 80. I'm strong. You seem strong. I'm doing better. You look better. 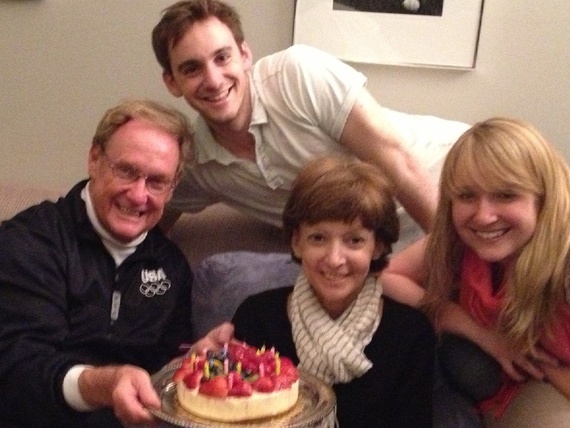 But here I am, still clinging to a lifetime of distractions, and mom has missed a birthday. Not just the things I'll miss. The things you'll miss. Like life and hell, grief is other people. "Hey, you look gross," I told my sister, in the afternoon of the day before my mom died. Kira stood in the hall, hands on hips, sucking air, glowing and sweaty. At the moment, I sat, slumped in a chair, feet on the glass table, with a large plastic 1997 MLB All Star Game cup with a splash of Johnnie Walker Gold dangling off the edge. Feeling normal: being a jerk. "Actually, I just ran 10 miles," she replied: being a jerk. "What are you doing?" "Your uncle and I are on our second scotch. So, this is how I've chosen to spend my day." "Hmm. I think my day is healthier." "You think that, Keek, but we're a team in this, and if you add you and me together, we're both exercising and drinking responsibly." We laughed, and she promised to take a sip, and I agreed to take a run, both of us lying politely. Mourning, even for the resilient, is a study in extremes, and, for the family and friends filling out our house, the crescendos were violent. We would scream at each other, and then laugh over wine, and then scream some more, and back to the wine. Grief is not a steady process, Bonanno said, but rather an "oscillation," like everything inside of us. Muscles tighten and relax, our bodies warm and cool, and so do our tempers. In that house, in those last days, we might have thought of ourselves as individual antibodies, pinging around the home, attaching ourselves to tasks to invent a small sense of utility. But we were also one house, one body, mourning to and fro. My mom always attracted friends with unteachable charisma, but in the last days, the gravity of her dying star pulled harder than ever. The house overflowed with people asking to ease the pain, mostly through our stomachs, cooking enough food to feed a moderately sized petting zoo. There was a theatricality to it, our trying to be heroes in a play where heroism is in vain, when the most poignant acts of generosity toward my mom were the smallest—a pillow fluff, a drop of Vaseline for her cracked knuckles, a half-spoonful of Jell-O so she could steal a taste after she knew her cancer would prevent her from eating again. They were hectic final moments, when the simplest requests about her condition would inspire a scene from Beckett. "What time is the doctor's appointment?" "I do know. It's 11." "I see it's scheduled for 3 on Friday." "I am letting her talk. She's talking right now. Aren't you talking?" "If I could finish my—"
"There are two appointments. One at—"
"That's what I said, on Thursday." "STOP! There are two appointments. Thursday at 11. And Friday at 3." "But what time on Thursday?!" This scene is verbatim. I wrote it down minutes after the exchange, convinced that deaths in Jewish families invented the genre of absurdism. But it wasn't fighting or theater, at all. It was the opposite. The deconstructive wave interference of too much love in a room. "There is always a little flicker there. It is a bit like the small glowing embers you see after a fire dies down. I carry that around me, a little ember, and if I need to, if I want to have Claire next to me, I blow on it, ever so gently, and it glows bright again." There are too many memories. Many of them are slipping from me. Others are so faint that only the rarest combination of triggers—vanilla, morning, a kitchen with an island table—bring the embers back to life. But a few are as close to me as breathing. We are eating at home, my mom, my dad, and me, organized around the sunroom table for dinner. It's a late-spring night, and the family band is keenly in sync, working our way through the memory catalog, grooving on the old hits, passing the melodies between us. "You always knew how to finish my sentences," my dad says. “Yeah," mom answers, "but if I could, I would end them with duct tape." He booms with laughter so hard that he has to dry his eyes. As I bus the dishes to the kitchen sink, I hear him over my shoulder, catching his breath. "Baby, you have to admit, it hasn't been easy, but it has been a laugh a minute." A pause. A last scratch of forks and knives. Enough time for the right answer. “Yes,” she says. “It has been. It has been a laugh a minute."